Lars Gamfeldt of the Swedish University of Agricultural Sciences in Uppsala combined with his many co-workers, has released a significant paper in Nature Communications. We all depend upon ecosystems in our lives and our forests form one of the major systems of human interest. Lars reckons they provide several "crucial" ecosystem services. Tree biomass, soil carbon, berry production, understory plant species richness, dead wood occurrence and potential game production are the services the scientists see the ecosystem providing. 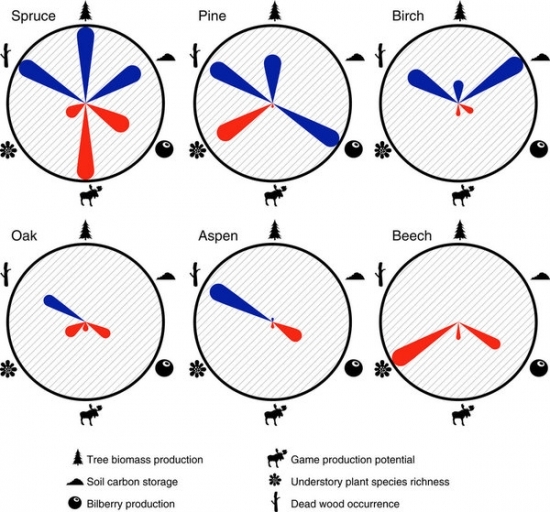 Biomass was also found to be 50% greater with 5 trees present than with only one. The biomes of temperate and boreal forest occupy 43% of the earth's forests. Using production forests that either regenerate naturally or are harvested and planted, the authors found them species-poor, with a maximum of 10 species throughout the whole sampling area, with the vast majority having less than 5 species. In spruce forests, trees grow quickly but berry production and dead wood production are negatively affected along with the plant species richness. Pine forests tend to encourage bilberry production, as you might expect, while birch encourages carbon storage. Aspen and oak performed less positively while poor old beech did not encourage any of the services. In the diagram below, the lengths of the 'petals' in these flower diagrams (one diagram for each tree species) reflect transformed effect sizes for the relationships in the main models. Specifically, the effect sizes (βn in equation (1)) have been transformed to range between 0 and 1, so that for each ecosystem service the effect size for the tree species with the greatest effect equals the absolute value of 1. Blue are positive relationships, red are negative relationships, and the outer circles represent the maximum value of |1|. The six ecosystem services are labelled by their respective symbols. Game production and dead wood occurrences were unfortunately negatively correlated which means they basically couldn't co-exist. For example, the spruce "petals" above show red for both of these services. All in all this great work needs to be acknowledged when government is trying to come to terms with economics. Forests are natural resources that are well-used, but maybe need to be used to their maximum. Instead of neglect, they need to be seen as havens for humans and wild animals, sources of wild food and many resources. The supermarket of the wild world is out there, but you can't shop with a single basket. Carbon storage at least has to be considered in the current "climate" as one of the greatest resources a birch forest can give us for the present and hopefully the future. Wild species cannot continue without help, appreciation and perhaps our education that they can provide what we can't - ecosystem stability.